Announcement March 2019 Update: I am shifting into primarily painting and posting ordinary mug restocks for this year, with custom orders being open now until March 31, and then again in September. If you wish to place a custom order, please do it in one of those timeframes. Here I strive to beautify the relationship between words and caffeine by providing coffee and tea drinkers with literary and geeky inspiration. 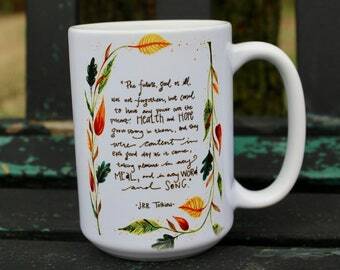 Each quote mug is designed to enhance the aesthetic experience of hot beverage drinking--whether first thing in the morning, on your desk at work, during a lazy afternoon, or just before bed--by reminding you of a story you love. Because, as we all know, "words are our most inexhaustible source of magic," and we dearly love finding good words to inspire our lives. My printed mugs are pretty consistent, but everything I paint is entirely unique, as I do all the work by hand, and paint on pieces that come from varying sources--many of them vintage and antique. This means, of course, that the mugs occasionally have slight flaws and blemishes, but also that I cannot replicate any mug exactly. I am happy to do my best to re-create a quote or design, but each piece that passes through my shop is really and truly the first and last of its kind. Thank you for understanding! March 2019 Update: I am shifting into primarily painting and posting ordinary mug restocks for this year, with custom orders being open now until March 31, and then again in September. If you wish to place a custom order, please do it in one of those timeframes. Received in perfect condition. My husband loved it. Thanks! Beautiful and great customer service. Only two original Always mugs left available! Finishing up two more of the Marauder's Mug! They're the last two of this iteration of the design, so grab them quick! I work out of my home, which means my living room doubles as a studio. I tend to paint large batches at a time. ...then color with a brush! The mugs are then baked to heat-set the paint, and run through the dishwasher to test for permanence. I never meant to go into the coffee mug painting business. No, indeed, from the age of sixteen I entertained grand schemes of becoming a child prodigy of a writer, of publishing an overnight success, and of rocketing into an easy career of book writing and publishing that would carry me into old age. Having an artist for a father, I ought to have known that "creativity" and "easy career" don't belong in the same sentence. But some things are best learned the hard way. When I graduated college with an English degree (child prodigy prospects beginning to look bleak), I set off to become a bestseller, little knowing the long, hard road I was facing. But an English degree wasn't the only thing I had to my name; I had also recently acquired a Pebeo Porcelaine 150 Paint Pen. 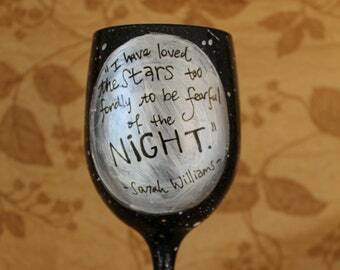 For fun, I painted one of my favorite poems on a coffee mug. It was by e.e. cummings, and I thought it would inspire me as I wrote. It did. So, I made an Anne of Green Gables mug each for my mother and grandmother. And then a Walk Two Moons mug for my best friend. They all liked them. A lot. My artist of a father, whose craft-fair gypsying always played an instrumental role in our family, suggested I paint some mugs to send with him to a show. "You never know," he said with a shrug. "Maybe you'll sell some." I did. And then some more at the next show. And at the next. One-point-five retail jobs, several dozen paint pens, and zero publishing contracts later, it started to occur to me that very few people make an easy overnight start to their dynamic publishing careers. In fact, I gathered that most writers tended to endure a painfully long slog before they finally caught their break. That pattern seemed to imply that I still had some time to wait before my name appeared on the NY Times Bestseller list. Wouldn't it be nice, I thought, if I could stay financially afloat without having to sell my soul to a cubicle? And so, two days before my birthday in December of 2010, Ophelia's Gypsy Caravan, the Etsy Shop, was born. I stole the name from my dog (she said she didn't mind), and started painting and posting the kinds of mugs I liked best. To my happy surprise, I found that other people liked them, too. (Even the obscure ones!) In fact, most of the people buying my mugs seemed to be a lot like me; many, as Anne Shirley would say, were Kindred Spirits. Etsy buyers are an exceptionally wonderful breed. And though I now have a literary agent and am editing toward publication, I find that mug painting--once a mere whim of a hobby--has taken root in my life and heart. Over the last five years I have grown to love posting new listings, simply for the joy of finding more people who adore the same things I do. It thrills me to know that the mug I am swaddling in bubble wrap is going to someone who loves Harry Potter, or Pride and Prejudice, or Lord of the Rings, or Doctor Who every bit as much as I do. That the person who will be drinking from it is really just a friend I haven't met. I can't think of any better way to keep from starving. I'm a reader, a writer, a gardener, and a geek, and my thirty+ years of life do nothing to diminish my status as a Crazy Old Bat. If I had spare time, I would use it to learn the art of beekeeping. I'm a nine year-old mutt who found Hanna as a lost and mangy puppy, and adopted her. (Construe that how you like.) I am probably a Catahoula Leopard Dog, but there's no ruling out the possibility of alien blood in my veins. My best friend is a cat. Jennifer prints t-shirts out of the back of her small antique shop on Yale and 11th street, a few doors down from Tally's. I met her one day when I was out walking and stepped into her shop to browse--and wound up deciding I wanted to try printing shirts with her! She is great, and very helpful. Randy is a private photographer and printer located in Tulsa, OK, and was available to do prints for me in my first ever foray into reproducing my original watercolors. Can I buy a mug that you've sold in the past? What about larger pieces you've sold in the past? (Canisters and tea sets and the like?) Can you make more? That all depends on what I can find locally. Like sold mugs, I can't often (if ever) reproduce an exact duplicate of a sold item, but sometimes I can find similar pieces to paint the same way. These sorts of custom projects usually take a long time, mostly because the actual finding of the pieces is a long and involved process, but if you're willing to wait a bit, please get in touch and we'll chat about options! How big are the mugs you sell in your shop? Usually, when I post a large collection of mugs, I do it all at once, and alert my Facebook followers and mailing list of their availability. Since time tends to be of the essence in those situations, I don't measure each cup's liquid volume, because that takes a lot of time. But if you'd like to know the size of any given mug, feel free to message me! In general, mugs I classify as "Small" tend to be 6-10 ounces, "Medium," 10-12 ounces, "Large," 14-16 ounces, and "Extra Large," 18 ounces and up. How should I care for my mug? Hand wash? Are they dishwasher safe? On the other hand, I have seen mugs whose owners only hand-wash sustain significant damage from scrubbing. If you want to hand wash, take care to scrub ONLY the inside of the mug, and never the artwork itself. Unfortunately, my mugs are not really wholesale material. They take me so long to paint that I really must ask the full price I charge for them, and can't discount for the sake of wholesale.